In pursuance of the righteous principle ‘pithru vakya paripalanam’ Sri Rama Chandra relinquishes the honor of being king of Ayodhya - in favour of Bharata. He also accepts the condition of leaving Ayodhya and to live in exile for fourteen years and leaves the city along with Sita and brother Lakshman. In the absence of Sri Rama, King Dasaratha dies and Bharata returns from his uncle’s place. Bharata was not prepared to accept the kingdom, only the eldest has the right to become the King. The royals decide to go to Sri Rama and request him to accept the kingdom. Accordingly the queens of Ayodhya, Bharatha, Shathrugan, learned pundits along with the royal priest Sri Vasista meet Sri Rama when he was camping in the mountain rage of Chitrakut. Sri Rama listens to Bharata and many others and asserts that it is not righteous to dishonor the words of the learned King and father and refuses to come back to Ayodhya and accept the kingdom. At one stage a brahmana called Jabali (pronounced “jaabaale”) spoke in support of Bharata stating that every creature is born alone and dies alone. There is nothing like MY father or mother since none belongs to another. It is unwise to get attached to them, as travelers have no belonging to any village. The king is separate and Rama is separate. He goes one step further and questions the wisdom of the sacrifices for the spirits of the dead. He states that it is a waste of food since a dead cannot eat. He emphasizes that these practices were composed by learned men for the sake of inducing others to give. He further states that there is nothing beyond the Cosmos. He urges Sri Rama to give precedence to that which meets the eye and ignore what is beyond knowledge. While not much is known about the Saint Jabali, it is that he had performed tapas in place near modern Jabalpur. The city of Jabalpur got its name from Jabali since he had performed tapas there. The kshetra purana of many temples in Tulunadu i.e., North Karnataka also mentions that the saint Jabali had performed tapas there too. There is an interesting kshetra purana of an Anjaneya temple in Tirupati hills which mentions about saint Jabali. On returning to Ayodhya after meeting Sri Rama in Chitrakut, Jabali felt that the words he spoke to Sri Rama to persuade him to come back to Ayodhya had hurt and angered Rama. Though the intention of Jabali was noble, the counseling words and logic he had used for that had hurt the noblest of noble. Rama had called him a firm atheist; fallen from the True path and said that he had misleading intelligence. Rama went to the extent of accusing his father Dasaratha for taking Jabali into service. The words of Sri Rama the righteous were haunting Jabali. As repentance to this act of his, he wanted to meditate upon the Truth, but away from Ayodhya. He had wandered towards the South seeking solace in meditation and lived at different places. He came across the place where Anjana Devi had undertaken penance to have a son and was blessed with Sri Anjaneya; he decided that he had come to the right place. Jabali started his penance at the chosen spot and meditated upon Sri Rama the Purushothama. 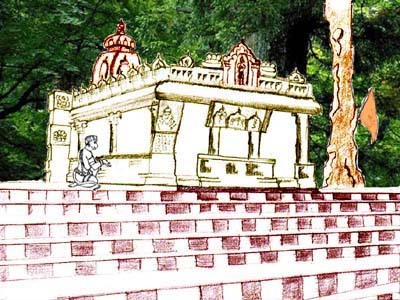 The hill where Anjana Devi had undertaken the penance is known as Anjanatri and forms one of the seven hills of Tirumala. It is known that the Tirumala is the abode of Lord Sri Venkateswara who is known popularly as Sri Balaji. The place where Jabali maharishi undertook his penance is not far off from the abode of Sri Venkateswara in Tirumala. There are many saints like Sri Vyasaraja, Sri Hatiram bavaji who had performed pooja in the Sri Venkateswara temple. The followers of the Saint Sri Hatiram bavaji were performing the pooja in Sri Venkateswara temple till it was handed over by them to Sri Ramanujacharya. From then on the rites at Sri Venkateswara temple are performed as prescribed by Sri Ramanujacharya. It was during Sri Hatiram bavaji’s time that the place presently known as Jabali Hanuman mandir was built and the legend founded. Presently Sri Prayagraj Maharaj is managing this Hanuman mandir. When the saint came to Anjanatri, he felt that he had come to the right place but should go further up the hill where he would find a water source. And also the presence of Sri Anjaneya [Hanuman] would be felt by him there. That would be the place where he would commence the penance to secure his goal. Accordingly he proceeded further and spotted the place, which is presently located on the way to Akasha Ganga from Sri Balaji temple. As you travel past Sri Venugopal Swamy temple [the last resting place of Saint Hatiram bavaji is also located behind this mandir] about three kilo meters on the left, near a deep bend you will see a board announcing “Jaabaali Sri Anjaneya Swamy Devalayamu” in Telugu. As you start taking the steps from this point and climb up further. You will be welcomed by the tall grown trees which are centuries old all through the route. You will pass through a forest which is very thick and dense. You will feel heaven if your heart is light, if it is otherwise, fear will clamp your heart. Go with a pure heart, and you will be sanctified. At the end of the walk of about one and half kilo meters you will see heaven. This is place where the Saint Jabali had felt the presence of Sri Anjaneya [Hanuman] and performed the penance in search of Truth. The saint started his penance meditating upon Sri Anjaneya [Hanuman]. Quite some time after Sri Anjaneya [Hanuman] appeared in person and assured the saint that he will be able to have dharshan of Sri Rama along with Sri Sita. After this the saint felt the strength of Sri Anjaneya [Hanuman], and with renewed vigor he started meditating upon the Truth. After long time of meditation the Saint was prompted to take bath in the water spring that would appear nearby. After some time a water spring was created by none other then Sri Rama himself with his arrow. Saint Jabali took bath in the tank and had washed off all his sins, then, Sri Rama and Sri Sita gave dharshan to the saint. Even today one can see the swayambu Sri Anjaneya in the same form as the one in which he appeared before Sri Jabali. A small temple comprising of a muka mandapam had been built around the Swayambu Sri Anjaneya. In front of the swayambu Sri Anjaneya temple one can see the water pond created by Sri Rama presently known as Rama kund. There is another pond on the back side of the temple presently known as Sita kund. The swayambu Sri Anjaneya [Hanuman] as the Saint Jabali saw is pleasant and attractive just like his name- Sundaram. The murti is three to four feet high, and Sri Anjaneya [Hanuman] is facing straight. The eyes are full of karunyam [compassion] that showers blessings on those who pray to him. The North facing Lord bless His devotees with Iswaryam [wealth of all sorts]. The Lord is seen with mace on His right hand and his left hand is seen resting on his all powerful thigh. He is seen wearing headgear studded with pearls and other stones. One can see Sri Rama parivar vigrahas in the same sannati. Come and be blessed by the karunya murti who had got Saint Jabali the dharshan of Sri Rama the righteous, the Truth Himself. * this article had been written after visiting Tirupati /Tirumala on 24-26 Aug 2005 during the chatur masya vritha of Sri Kanchi Komakoti peetadhipathigal. The sketch of the temple as then was done by the author.